The Event App Customization add-on allows you to customize some aspects of our event app. Basically, once you’ve uploaded a logo to your site and login once, the app will be customized to show your company logo. Need to Buy a Support License for the Event App Customization Add-on? This add-on requires Event Espresso 4.9.9 or newer. It cannot be used with old versions of Event Espresso 4. Download the latest version of the Event App Customization add-on from your Event Espresso account. 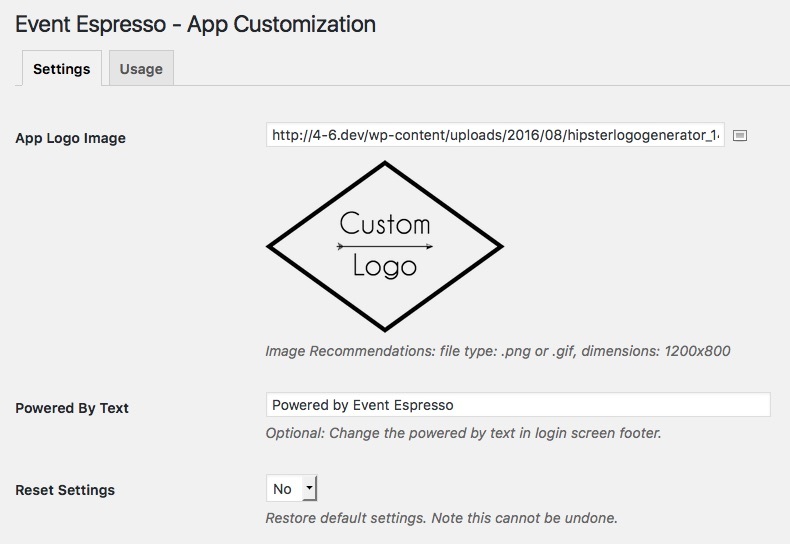 Login to your WP dashboard and go to Event Espresso –> App Customization. You’ll now be viewing the overview screen for the Event App Customization add-on. Simply upload a logo and save the page. Next time you login to the EE4 event app, you will see your logo on the login screen. Use this field to upload your own logo for use in the event app. Defaults to the “Company Logo” that is set in the Event Espresso > General Settings page. Optionally replace the “Powered by Event Espresso” text in the login screen footer. Will the customizations take effect the first time I login into the event app? Yes, after logging into the app the first time, you will notice that any events without a featured image will now show your logo, instead of the Event Espresso logo. When logging back into the app (after logging out) you will see your logo on the app login screen. Are you running a current version of Event Espresso 4? This add-on needs at least version 4.9.9 to activate.